How did this piece of shiite get into Australia? View this clip on MEMRI TV here or below. Ismail Al-Wahwah, leader of the Australia chapter of the Hizb Ut-Tahrir international pan-Islamist organization, who was arrested in Jordan in July 2018, was moved in November 2018 to Jordan’s maximum security Al Muwaqqar II prison. The prison also houses Al-Qaeda terrorists. 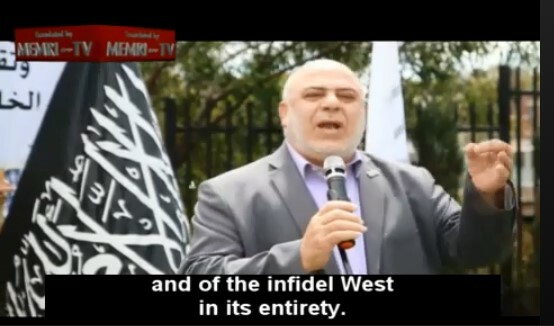 In 2015, the Anti-Discrimination Board of New South Wales (Australia) sent two MEMRI TV clips of Al-Wahwah’s statements to the NSW Director of Public Prosecutions, since Al-Wahwah’s statements might have been be serious enough to incite violence or involve a threat of physical harm. At the time, Australian Prime Minister Tony Abbot was arguing that Hizb Ut-Tahrir should be banned in the country for hate preaching. Al-Wahwah, however, was not charged, and as a result, the government said it would fix hate crime laws. In June 2018, more stringent race hate laws were introduced in NSW. 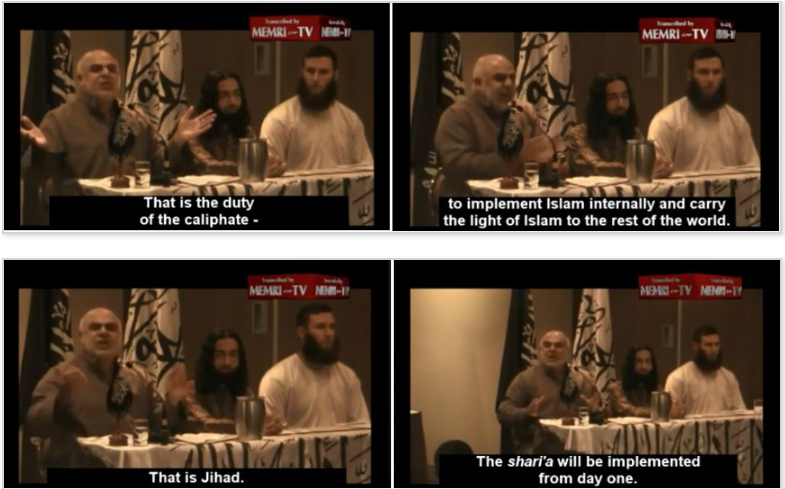 Hizb Ut-Tahrir’s purpose is to re-establish the caliphate in the Middle East with sharia law. While the organization is banned in Germany, the Netherlands, Russia, China, Turkey, and across the Middle East and South and Central Asia,Australia has rejected banning it. Hizb Ut-Tahrir Australia is currently circulating a petition to the Jordanian government demanding Al-Wahwah’s release. The following are MEMRI TV clips of Ismail Al-Wahwah. At a July 25, 2014 rally for Gaza held by Hizb Ut-Tahrir Australia in Sydney, Al-Wahwah announced that “any Jew living in Palestine” is “a target of jihad,” and added: “Oh Jews, nobody will give you peace, not the Arab rulers, not the world’s [rulers], not the UN Security Council, and not the Palestinian Authority.” He also said: “Wherever the Jews thrive, corruption abounds. All the power in the hands of the Israelites was based on corruption – corruption in the media, moral corruption, financial corruption, political corruption, corruption in everything that is associated with the Jews… The entire world suffers from the Israelites today and complains about them. Who will set the world free from the Israelites, so that the world will be able to say that it has rid itself of that hidden evil? In statements on the Australian Voice of Islam radio that were posted online on October 16, 2014, Al-Wahwah said: “Our true conflict is with Europe and the US. They are the enemy.” Additionally, in an October 10 Friday sermon at Sefton Mosque in Sydney, he warned “By God, your civilization will pay the price” for defiling Muslim women’s honor. The MEMRI TV clips were sent to the Board by the New South Wales Jewish Board of Deputies. Almanac.afpc.org/hizb-ut-tahrir, April 19, 2018; Rt.com/news/265309-islam-danes-not-vote/, June 5, 2015. He does not give details, of how we dishonor Muslim women and when did this happen? Since when do they need a reason to hate and attack? Inverse speak … Again – Just like the OIC controlled UN !!! (that sounds about right … sounds spot on – it is spot on) !! !